We have multiple years of experience as a Magnetic Level Gauge Manufacturer in India. 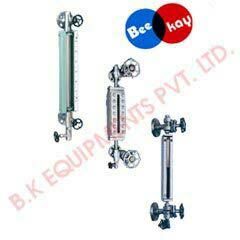 We provide a wide range of durable Level Gauges that includes Boiler Level Gauges, Magnetic Level Gauges, Reflex Level Gauges, Transparent Level Gauges and Tubular Level Gauges. Today, we are counted among the major Transparent Level Gauges Manufacturers and Tubular Level Gauges Exporters in India. Our Level Gauges are highly appreciated for providing accurate reading for different kinds of liquid. Auto shut off ball check valve arrangement available with our Level Gauges assures maximum safety. Extensively used in pressure vessels, boilers and tanks, our Level Gauges are available at affordable prices. We are positioned ourselves as a reliable Magnetic Level Indicator Exporter in the market.